My name is Timothy Soo and I am a first year diocesan seminarian. I am 28 this year, and I previously practiced as a litigation lawyer for about 2 years. I am a son of this parish and am very glad to share my vocation story with you for Good Shepherd Sunday. Like all good stories, it is about a story of love. 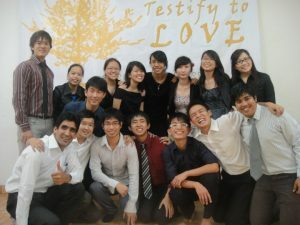 I fell in love with God back in 2010, while attending a 6-week discipleship programme called the School of Witness. I attended this school with the intention of “resuscitating” my faith which I felt had died during my National Service which I had just completed. But God surprised me. Instead of merely reviving my faith, He changed my life. In a very real way, I came to know and love the person of Jesus Christ. God was no longer an abstract being, a man in the sky, or an ethical concept – He was my friend. I had experienced God’s unconditional love and for the first time entered into an authentic and living relationship with Him. This is my first reflection: the Good Shepherd is Generous – He gives us so much more than we deserve. I gave Him a lowly 6 weeks; He gave me eternity. What followed this definitive encounter with the Lord was the opening of my heart and mind to His will for my life. It was then that thoughts of the priesthood crept in. It started innocently enough: I just paid more attention to the priest during mass, and imagined myself doing what he was doing. Over time, this fascination grew and deepened into an appreciation and attraction to the radical giving of self in the priesthood. Something in my heart had awakened, and a desire for more was being stirred. However, this restlessness was accompanied by fear and trepidation. I was in a stable relationship then, with a good and faithful Catholic girl. I was doing well in university and had a promising legal career in front of me. I had everything I should have wanted. But yet, I was still restless and dissatisfied. Despite my best efforts at ignoring them, these feelings increased over time. I questioned myself and God repeatedly and I was internally in turmoil: was God asking me to give up all that was good in my life? This brings me to my second reflection: that the Good Shepherd Invites – He does not force, He does not arm twist; instead, He called me, and He calls us, with a gentle but persistent voice. I knew that a decision had to be made amidst all this tension. While it was extremely painful and brought about much uncertainty, I knew that I could not lie to myself, or to my then-girlfriend any longer. There was a real desire and call to discern a vocation to the diocesan priesthood more freely. We eventually ended the 2 year+ relationship. While the process of healing and closing the chapter took time and there were many moments of loneliness, it was not wasted because we both learned how to love authentically. What is beautiful is that we are still friends today. In fact, we are able to talk about the past and see God’s hand in our shared experiences, and to be grateful for them. My third reflection arising is this: that the Good Shepherd is Faithful – He honours the sacrifices we make, and provides for us always. Throughout my entire discernment journey of about 7 years, I have come to believe and experience that my deepest desire is to love God by serving Him and His people as a priest. I can only be “fully alive” through this total giving of my life, by being available to love individuals in a deep yet non-exclusive way. I want to spend my life for others – by ministering to them, by journeying with them, by bringing Christ to them. There is a deep resonance with who I am and who I want to be when I think about the priesthood. My fourth, and final reflection, is this: the Good Shepherd is Truth – His will for me coheres perfectly with my deepest desire, with who I am meant to be, with what will bring me the greatest fulfilment and joy. Being immersed in the Truth also allows me to recognise what is fleeting in my life, and to give that up for something far greater. 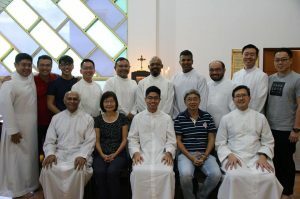 Since vocation is the unique way in which I am able to love God best, the best response I can give at this point in my life is to undergo formation and further discernment as a seminarian. This of course, is a decision made in complete freedom. With freedom, there is peace. With peace, there is joy. My story is a testament to how the Good Shepherd is Generous, Inviting, Faithful, and the Truth. You will notice that the first letters of these four words spell “Gift”. In the final analysis, that is what a vocation to the priesthood is. It is a gift to the person who is called. It is a gift to the people to whom he is called to serve. It is, most importantly, a gift of that person’s life to God, who has given life in the first place. My dear parents, the greatest gift you can give your children is to allow them to pursue their vocation freely, and better still, to do so with your blessings. As my own parents will testify, there is great joy in being able to surrender what has been entrusted to you back to the Lord. To the young men here who feel a restlessness in your heart for something more – you are not alone. There is something more – this could be life in service of Jesus Christ and His people as a priest. Do not be afraid! Christ takes nothing away, and He gives you everything. Do not let your fear make you settle for a mediocre and inauthentic life. It is in giving, that we truly find ourselves. Therefore, let us entrust ourselves totally to the Good Shepherd. Please keep all of us seminarians in your prayers. Thank you, and God bless.